Album art work inserted into every MP3, Flac, AIFF song. Secure, user friendly Passcodes, 8 per track, to facilitate multiple sales to same client. Passcode expiration scheduling is adjustable. 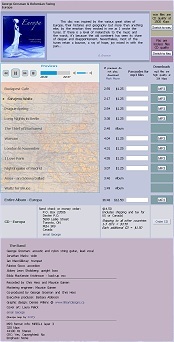 Song order page pops-up and hovers over your website. Color scheme and background can match your site. Wallpaper album cover insertion to full album download. Printer ready Passcodes pdf sheets 60 / page for each song and for the entire collection download. One extra, alternate format complete collection download (not individual songs). No dbase, PHP, MySql, ASP needed. Service works on any web site that has ssh access. This makes the service very robust. Hard disk storage is only one copy, per format, per song. There are not multiple copies of songs eating up your online storage. File system is well protected with over 2.5 Billion passcode possibilities. No two passcodes alike and separate passcode access for each song. Site security upgraded. All random page searches go to an error page. Remote linking to your content prohibited. Passcode sheets are password protected. 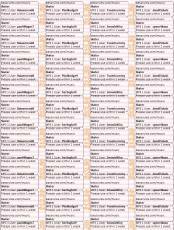 Example 11 song download sheet, 3 songs are album only. Passcodes example - Sticker page for a complete download of the CD 'Skater' in MP3. 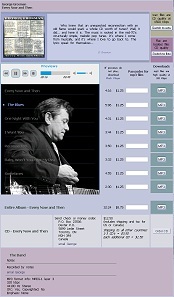 You will get a pdf page, per song, for every format.